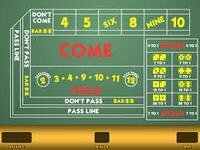 It is odd for Lexis Games to talk about the worst bets at craps when everyone is looking for best bets. And what are these worst bets? Let's talk about percentages, which often leave a player with a question: Will it bring any good? In gambling percentages are considered chances, you must simply use a formula to understand the puzzle. The role of casinos is to take money from you, now turning these percentages into actual money is your goal. Let's say the remaining bets on the table are all worst. They will most likely to roll into one propositions. Various bets are being shown in the table below. The hardways and big six/eight are also included for you to see the comparison among the worst craps bets. For example you will place a bet for a horn that is combined with 2,3,11 and 12. It's like you are betting for each number separately and your bet will be divided into quarters. This long-shot bet can put money down into four multiples or you may request for a horn high and choose among the four which one you want the extra money. Another worst bet on the table is the "Any Seven," otherwise known as "Big Red," people will most likely throw all their money in "Any Seven" as this could bring a whopping 16.67 percent which means for every $100 bet on the "Big Red" your expected loss is $16.67. Now try to compare 16.67 to 1.4 percent. Why would a player bet for a loss of 16.67 than 1.40, a smart player knows that for sure. Hopefully after witnessing the worst video games ever, you 'll want to play craps and win good. Just stay with the basics as it could bring all the good.